Healthcare professional with an avid passion for television and film. Recently word was released that Stana Katic, who plays Captain (formally detective) Kate Beckett on Castle parallel to Nathan Fillion, will not be brought back if the show gets a season 9 renewal. In addition, ABC also let go of another female regular, Tamala Jones (who portrays medical examiner Lanie Parish). ABC's decision to let go of two regular female cast members, one of which is the co-lead on the show, left a sour taste in everyone's mouth. This isn't a phenomenon that is isolated to the network. Sexism in the workplace is well known occurrence throughout many industries. Hollywood, however, is an industry that affects the general public at large. Everyone sees this industry. People watch TV, movies, etc. The Hollywood industry is in our lives day in and day out. To witness a network as big as ABC, showcasing their sexism is degrading to women everywhere. We are still fighting for equality. Women are still paid less than men and the fight to close that gap isn't showing any signs of slowing down. Seeing that big time networks have the privilege to let go of their female lead in order to save money sends out the message that women are expendable. It says, 'no matter how much work you put in, if we need to save money and you're female, be scared.' The battle is far from over and set backs such as these make the mountain higher and the climb harder. Katic has been a loyal member of the Castle family. She's gone out of her way to promote the show, interact with fans and show love and support to her fellow cast members over the years. Getting the boot after years of dedication and 110% in everything that was thrown at her is a slap in the face. Her character was the heart of the show. Castle had always been a show about a writer and his muse, writing her story through his eyes. This show was her story. This character went through a massive transition that gave hope to people everywhere that no matter what, if you work hard it'll pay off. Never give up. The news of her dismissal almost kicked that memo out the window. The creators of the show created a love story that would stand the test of time and crafted one of the greatest female characters on TV. Their heartbreak over Katic's dismissal was felt by fans all over the world. 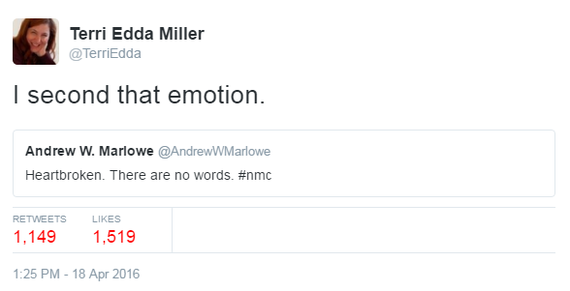 The Castle fandom does not want to see the show they loved go down in flames. 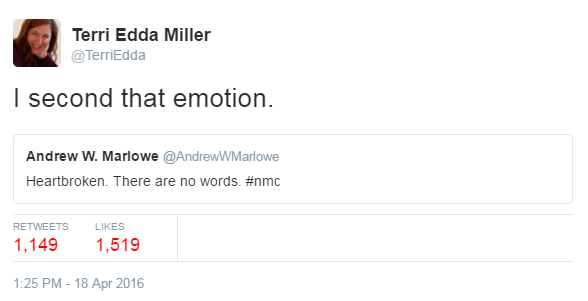 They want the show to end on a high note that keeps the legacy that Andrew Marlowe and Terri Miller created alive. They've started a petition to end the series now and give the show the conclusion it deserves. To give Caskett the happy ending they deserve and to give the legacy of Castle a chance to stand the test of time and live on in our hearts for years to come. If you believe in equality sign the petition and let ABC know that dismissing the female lead of a show is never the answer.